Do you want to know how to get on The Walking Dead? Do you want to get madeup to look like a zombie and be an extra in AMC’s hit show The Walking Dead? If so, you may have a shot. 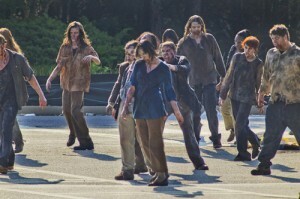 The Walking Dead uses numerous extras to portray the zombies in the series and when the show is shooting, casting calls for extras go out in the Atlanta area where the series is shot. The show is about to begin filming for the 2014 / 2015 season in Atlanta and may give those that want to be on the show a shot at it. Casting calls should begin next month and the show makes the people who are cast to be a walker attend a zombie school where they will learn how to walk and growl like a walker. People who have been cast on the series say being a zombie walker may not be as easy as it looks after applying all the heavy makeup. So stay tuned for updates because casting for walkers and maybe even survivors will begin very soon. round and trying to feed on the remaining humans and animals left alive. Society as everyone knew it is gone… no more TV, no more electricity, no more running water, no more department stores, and no more internet. The Walking Dead is the story of survival of one small group of people as they go about trying to get through life one day at a time. The story begins with Rick, ex cop, waking up from a coma only to find the devastation outside and the blood thirsty zombies. Rick meets other survivors and they keep moving trying to find safety. Rick looks for his family and miraculously finds them well and alive. The group now battles zombies and attempts to get the zombies before the zombies get them. They find guns and ammo along with other weapons, cars, gas, and food along the way. This last season saw the prison come down and the tight knit group all got separated. With only 2 episodes left, we gotta hope they all catch up to each other very soon… or maybe that is what the season finale is for? Here is an example of another extras casting call for The Walking Dead for a previous season – Season 2 saw over 6000 people apply to be zombies on camera. Zombie extra – can this be you? Are you OK with really long hours in hair and makeup? 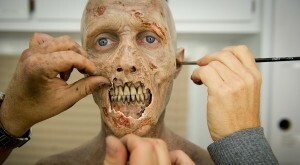 Do you want to be turned into a zombie so that you can drag your feet and lurch around on set of The Walking Dead? 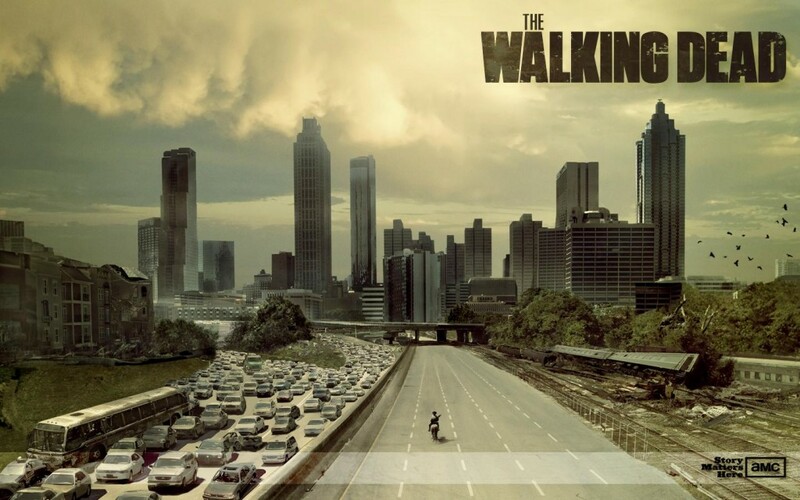 The Walking Dead is looking for extras in Atlanta. Email your resume and photo to twdextras@gmail.com. please include a photo, your height, weight, and age. The walking dead is my favorite show on TV without a doubt. Robert Kirkman is a genius. I am a great actor. Had a small part in the siege with Denzel Washington and the Son of Sam in the late 90’s. I am back into acting again, I think I should be picked for the walking dead cause I know the show inside out, I breath, sleep, dream of the walking dead everyday and not to mention I would do a fantastic job….As an actor and as a character you will love me. Please consider me I woud love to be part of the walking dead. Thank you very much. Hey there. I’m 24 years young. I have an unhealthy obsession with the walking dead. I do the zombie walks every year in my town of Fairfield, CA. I’m very confident I would make an awesome zombie. That, or even a survivor. 🙂 let’s do this. Hello my name is Leela and I’m an 11 year old girl but I’m told that I look like 12. I’m a very good at acting ( I’ve only been in a few plays ) but I’m skinny so I could be a walker, but I would prefer to be a human. Hi my name is Keshaye, I’m 26 years old. I have a 4 year old son. I live in Canada but I travel all the time. I am a HUGE fan of TWD!! I would LOVE the opportunity to be a walker / human on the show! Thank You! I am a big fan of The Walking Dead, I always wanted to be on The Walking Dead. I always watch it on Sundays, never missed an episode, my dream is to become a character on The Walking Dead like one of the main character’s for example: Rick, Carol, Maggie, Glenn. I have been trying to look for auditions for the walking dead for days, it’s just really hard. Being on The Walking Dead is like a dream come true. I would really love to be on The Walking Dead show, that would be the most amazing thing that could ever happen to me. I am 13 years old and I am a very high spirited girl. I’m 5’2 with dark curly hair. My friends say that I’m totally obsessed with TWD, but really, truly I’m just a huge fan and have never missed A single episode of TWD!!! I have theater experience from multiple school plays. I am a really fun gal and have hopes in being on the show (walker/survivor)! Hi I’m Bella, I’m 12 years old, I watched a lot of the walking dead, I’m 5ft and would LOVE to be a zombie or a survivor on the show. I also think that Carl should have a girlfriend, and I could play that part. I do have some experience with acting, and my uncle is an actor who taught me a lot of things. I could be a zombie or a survivor. Thank you! Hi, I’m Chris, I’m 16, and I would really like to be in the walking dead series either as a human or a walker, I have done small acting parts for school and I do gymnastics. thanks! Hi! My name is Kate Thompson, I’m 13 years old, 5’2. I have amber colored hair, and I would love to go on the Walking Dead! I have been a fan of the show since it started and I think having an opportunity to be on the show would be a dream come true! I would love to be a walker on The Walking Dead or find out how I could become a walker on The Walking Dead. Hi my name is Kimberly! I’m 13 years old going on 14 in may. I LOVE the Walking Dead. The Walking Dead is more than just a t.v show to me, it’s my life. I know all the characters like the back of my hand. I am 5’3 and white with dirty blonde hair. I would love to be apart of the walking dead cast. I could be someone that the group stumbles into and becomes part of the group or be apart of terminus (Mary’s daughter or something) Carl NEEDS a girlfriend on the show! I wouldn’t love to be her. I watch the walking dead right when I get home and I watch it until I fall asleep. I would love to be apart of the walking dead! Thank you and have a nice day!!! Hey my name is Veronica and I would LOVE to be in your show! I am a mega fan of the walking dead. I am also 12 years old. The Walking Dead is my favorite show and ever since it premiered, I’ve always wanted to become a part of the show! I love zombies and horror shows so this would be an awesome experience for me. I’m a high-energy type of woman whom likes traveling to fun and exotic places. I’m early 40’s and my height demands attention. Kinda tall and medium built. I’m a lifelong art student who likes theatrical plays and viewing screen plays. 12 years old and would love an opportunity to audition for a part on The walking Dead. I have done modeling, dance, gymnastics all my life and have done auditions in Boston, I have Comp cards and modeling pictures and also did an audition for Lions gate productions – If you are interested you can contact my mom. I love walking dead so much. I would love to be a lonely girl looking for help and I see Carl and Rick and they help me or I would be a zombie. 15 years old and I am 5’6. My daughter is “dead”icated to The Walking Dead. She lives, eats, sleeps and breathes the characters, the show and everything The Walking Dead. I created a fathead mural for her wall for Christmas and that was her absolute favorite gift. Her ultimate dream would be to be a part of the cast, either in the form of a Walker (she won’t let me say zombie, because that is not what they are called in the show), or as a child actor. Every parent wants to help their children achieve their dreams, and this is one dream I would like to help her achieve! I’m 28 years old, I’m fascinated with zombies. I’d love to be one on your t.v show as an extra zombie. Please help me become one on your show. The walking dead is the best show ever! I’m a great actor and would love to be on the show. I’m 12 years old and the walking dead is my favorite show. I think that Carl should find a girlfriend and I could play that part and maybe in the end they would be the only ones left after the apocalypse to re-populate the world lol… But anyways, It would just be amazing to be on the show. I would even play a zombie. looking forward to having an opportunity to be in your cast. I’m 37 years old, thank you for your time. Hi my name is chyanne, I’m 12 years young, 4 ft 9, I’ve seen a all the seasons but 4. I’m still in the middle of finishing it. I am willing to be an extra or a character in the show and hope to be the next zombie or maybe if I’m lucky, a new character of The Walking Dead, thank you. Hi my name is Leah and I’m 13 years of age and have watched every episode of the walking dead. I would totally love to be a part of the crew even if it wasn’t for long. I have always wanted to do something so big since I almost lost my life 6 months ago due to a car hitting me while walking. See I’m part zombie too lol. The walking dead.